My father-in-Law's 60th Birthday was approaching very quickly and I felt inspired to make a memorable and delicious cake for his celebration. My husband's family has been nothing short of wonderful and have treated me like a second daughter. My backstory is that I moved to America as a student, fell in love, was married, and have been here ever since. While it all may seem like a fairytale I must admit there is one drawback. My decision to stay in America also meant that my own family is still over in Europe. I have visited and we talk often, but I miss them. My in-laws have been a second family for me and have been so supportive and helpful. So, when I was home for maternity leave with my second son I became a devoted fan of TV shows like Cake Boss and Fabulous Cakes. In the months leading up to my father-in-law's big day I wanted to challenge myself and see if I could create something that would make his big day even better. This was my very first experience with fondant and decorations, so it was pretty nerve racking. I worked hard to make my cake as delicious as was pretty, so I made a yellow cake with chocolate mousse and cream cheese filling. I used Lorelie's chocolate mousse recipe and it worked perfectly! I was so proud of myself for showing patience, creativity, and craftsmanship when I saw my final product. While it was a challenge it was also very rewarding and extremely fun and creative. Was it difficult, yes, but the look on my niece, nephew, and of course my father-in-law's face was definitely worth it! 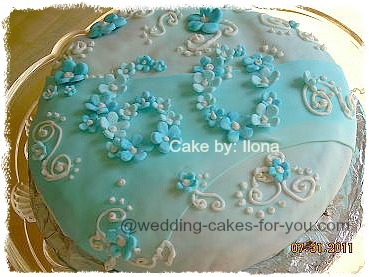 Hi Ilona, Your 60th birthday cake challenge is a success story all around. I love all of the pretty little fondant flowers. The colors are also very beautiful. Your father in law is very fortunate to have a daughter in law like you. 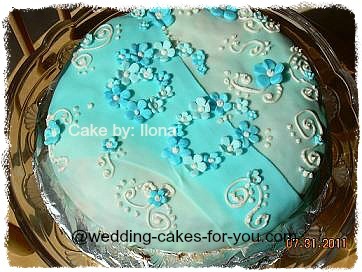 Thank you for entering the cake decorating contest. Good Luck.